It was a late February morning as Sharon Ray led our silent procession to the Wheel of Life, an exercise in Mindful Walking Meditation, styled after the precepts of Thich Nhat Hanh. A cosmic blessing indeed to watch the pretty lone poppy as if proudly declaring, “Here I am – alone, yes, but here to offer joy and bring a smile to the faces of all who enter upon this sacred trail.” And smile we did! Weeks later, a large group of us made another procession to the Wheel of Life Seed Ceremony led by Sean Fennell. And what were we sowing? Poppy seeds! 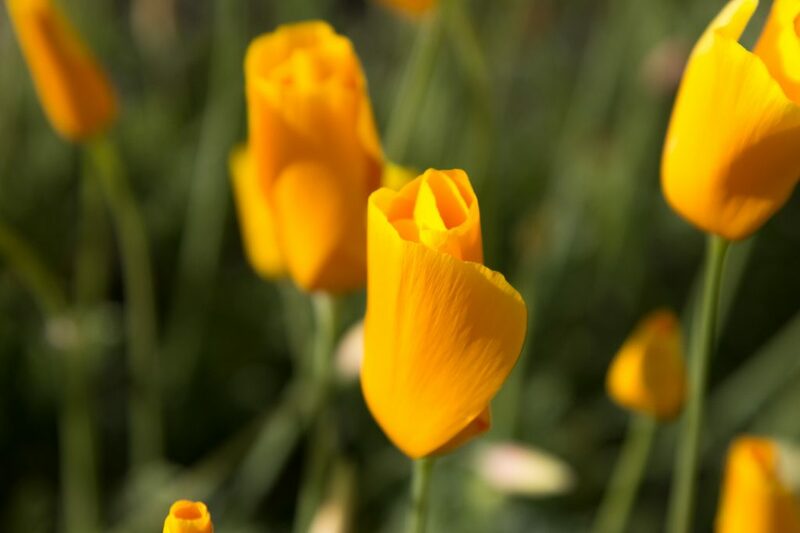 Could it be a Divine call from that lone poppy that she needed friends? Could it be Divine Mother’s blessing that she recognized just how much we appreciated her lone poppy child and wanted us to create a glorious poppy community? Whatever it was, it was all wonderful, for as retreat participants made their sacred seed offering at the Wheel of Life – sowing symbolically the seeds for the future flowering of their innermost hopes and desires – we knew with conviction that Spirit had heard our prayers and proclamations. Having explained the Wheel of Life and its significance spiritually as our inner journey, and physically as our outer journey in the world itself, Sean talked about the spiraling nature of our inner journey and showed amazing physical examples of spirals in nature, some of which (a conch shell and pine cone) powerfully captured the message that all life forms, including us humans as well as the orbiting planets and galaxies themselves, are always moving and expressing their spiraling nature. 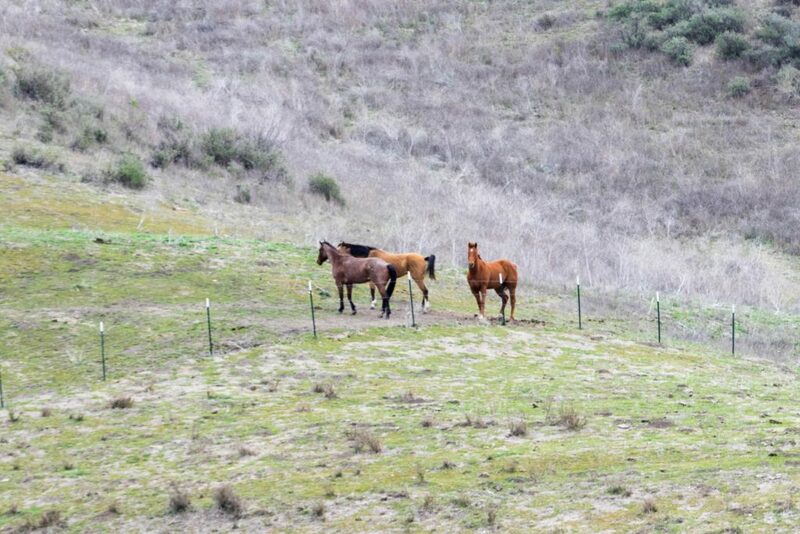 Once again, the same three horses stood majestically in the exact location they had for the Mindful Walking event weeks earlier, as we proceeded down the hill toward our lodge area. 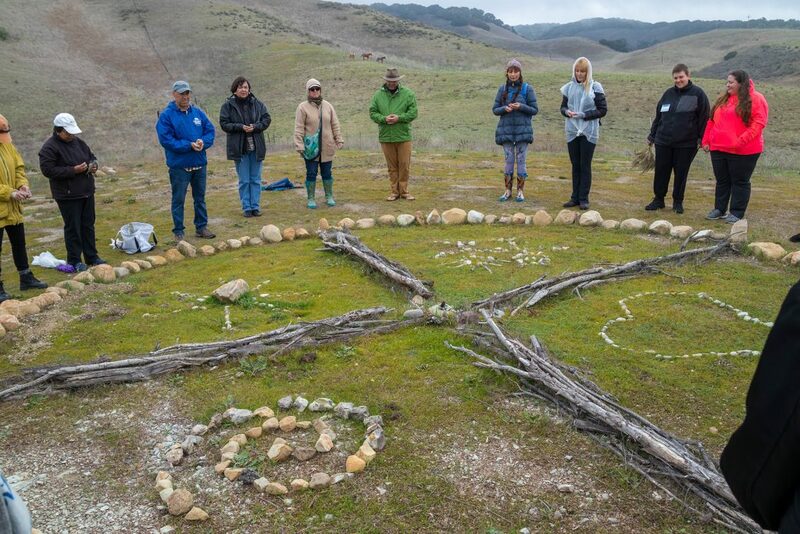 Inwardly, I felt that Divine Spirit and the Ancient Elders of this sacred Chumash land were showering countless blessings upon us and our sincere efforts through these events to bring back Heaven on Earth, right here, right now. Nourishing rainfall did not deter the afternoon’s planned outdoor events, for in its place an incredible Permaculture movie was shown that created an atmosphere of great anticipation and excitement as participants later eagerly planted trays of vegetable seedlings. These were to be taken home for infusing their own gardens under the guidance of Sean Fennell. Two months filled with many treasured memories of wonderful people, incredible energy, and great learning, blessed by three stately horses and that glorious lone poppy!